LA County Public Health is so committed to encouraging physical activity that it has constructed an innovative Bike Donor facility on Melrose Avenue. 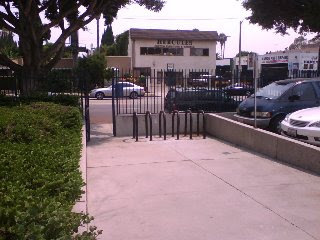 The program consists of several bike racks, on County property, hidden from those on the street by the wall, and as far from the building entrance as possible so that Security can't interfere with the Bike Donor program. 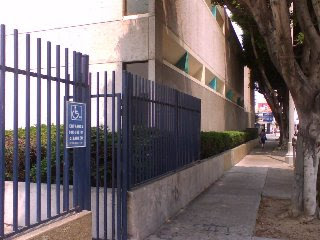 Unsuspecting County Health clients enter the Disabled entrance (they're not driving a car = handicapped) and lock their bikes to the bike racks. They leave and walk around the building to the entrance and conduct their business. Those in need of a bike simply crouch behind the wall, take their time liberating the bike from the rack, walk through the gate and ride away, courtesy of the County Health Bike Donor Program. 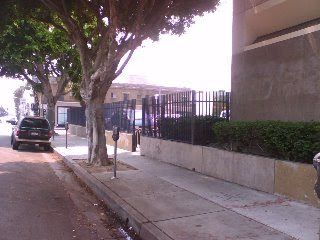 By the way, LAMC 12.21 requires City Facilities to provide parking for bicycles (2% of required automobile parking and as close as the closest off-street automobile parking) but this is County Property. They have their own rules! 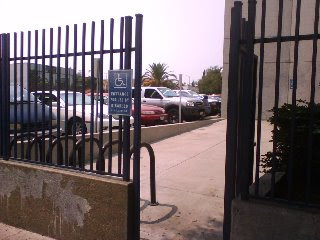 Bike racks accessible from the sidewalk but not from the parking lot. A sidewalk with little activity and little interference from passersby. Again, a sidewalk with little activity and little interference from passersby. 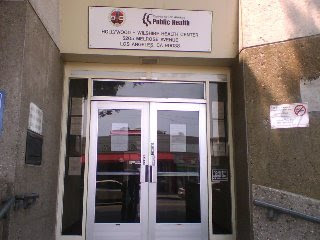 The "people hole" in the side of the imposing Public Health fortress.